From quirky decor to unique life stages, these mods have it all. The Sims 4 is the game that just keeps on giving. Whether it’s new expansion packs or fan-made mods, there is always something new to change how you navigate your way through your Sims’ life stages. This is a collection of the best Sims 4 mods that were created in October of 2016. Finally, a mod that will let you stop sugar coating how you really feel. 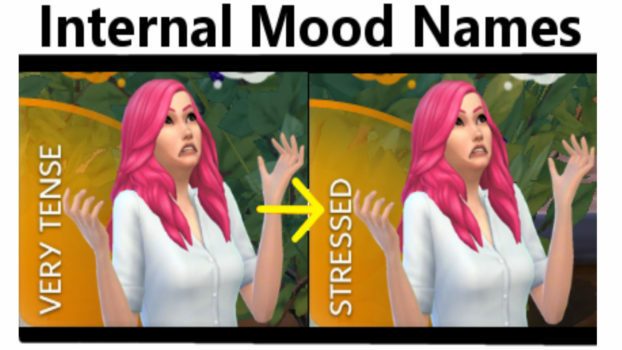 Why settle for an emotion that says you’re feeling “very tense” when you’re really just feeling downright “stressed.” It may seem like such a simple mod but when you’re really wanting to capture the essence of your Sims’ emotions, it can make all the difference. This mod will alter emotion names to be far more accurate about how your Sims really feel. If you want your Sim to be at one with the universe then this mod is for you. This mod makes the Spiritual Trait available for your Sim, which means your Sim won’t get flirty or angry. Instead, they will be happy, focused and inspired. In September, The Sims 4 players finally had access to a Crazy Trait for their Sims and now there is finally a cool place to put them. If you want to build a story about your crazy Sim, this Greystone Asylum is exactly what you’re looking for. The asylum comes complete with a calming soundtrack for Sims who might be a bit off their rocker and an electroshock therapy room. There’s tons more to discover in this mod but we’ll let your own crazy Sim discover all this victorian mansion-style build has to offer. Have you ever wondered why The Sims 4 was missing some more action? Like down and dirty, put a Sim you hate in a chokehold and recreate a WorldStar video type of action? Well, one Sims player has been pondering the very same thing and has added a great way to get some more street fights into the Sims. This mod eliminates the fight cloud and even creates some fun customizations so your Sims can create more trouble. Sure, you could just watch your Sims grow from a baby to a toddler to a child to a teen and continue through the life cycle until it’s time for the Grim Reaper to come collect what’s left of them. The other alternative is to mix things up by adding a Succubus life stage for your sim. This new mod introduces succubus, incubus and cambion life state options. Each one comes with its own intriguing set of traits and abilities that add an unexpected variable to your usual Sims gameplay experience. Sometimes you just really want an all girls club or you just want a safe space for the boys to be boys. This mod will add a gender filter for you to use when creating a new club for your Sims. Whether your Sim is a science buff or just downright maniacal, there is a ton of fun to be had with this brain swapping machine. Unfortunately, the mod will not actually alter your Sims’ traits or otherwise indicate that their brains have been switched but it’s still a pretty cool visual and a unique piece to add to your home. Alter your Sims’ aging rate with this new mod. If you have ever felt like your Sims’ should follow a weekly aging cycle, this mod is just what you need. Every 7 days you’ll see your Sims enter the next stage in their life. This art series is all about inspiration and inclusivity. This collection features uplifting messages for Sims and gamers alike who may be hoping to overcome their own medical hardships. The pieces were made in honor of Dysautonomia Awareness month and come in a variety of colors to blend in with your current decor. Have access to your favorite outfit on the go or have a place to store all your belongings without adding a bulky wardrobe to your space. This travel bag is a great piece for any Sim who is hoping to come from rags to riches or just looking to save space. Sure, some Sims want to go the modest way of a space-saving travel bag. Other Sims want to go big, bold and beautiful when it comes to their wardrobe. If your Sim is the latter, this mod is a dream come true. This mod gives you access to a pretty impressive collection of built-ins in a variety of different colors so you can finally have the closet of your dreams. Stop sacrificing counter space just so you can fit in a microwave. This mod gives you a much better way to store that essential small appliance in a way that also looks absolutely fantastic. You can sort through a variety of different design options for your new wall-mounted microwaves so you can save space and look incredibly stylish all with one simple purchase. Tired of your clumsy Sim breaking the computer? Well this computer not only looks great but it’s also indestructible. This unique addition to The Sims 4 features a cool dragon design along the back while also giving Sims some pretty useful mood boosts if they decide to use this particular computer. Technology certainly has come a long way, huh? So you want your bathroom in The Sims 4 to be just as unique and practical as you are? That’s certainly not too much to ask… not with this mod anyway. This mod will allow you to mix and match cool shower and bathtub combos so you can have an all-in-one hygiene solution that is made to perfectly fit your Sims’ design aesthetic. The only thing better than an in-game candy dispenser is a fully functioning in-game candy dispenser. This mod will give you a convenient way to grab some treats to satisfy your sweet tooth or to pacify a toddler. It’s all up to you. Finally, a mod that will let you stop sugar coating how you really feel. Why settle for an emotion that says you're feeling "very tense" when you're really just feeling downright "stressed." It may seem like such a simple mod but when you're really wanting to capture the essence of your Sims' emotions, it can make all the difference. This mod will alter emotion names to be far more accurate about how your Sims really feel.